Adekunle Ajasin University, Akungba-Akoko, AAUA Faculty of Agriculture Change of Course Form for the 2015/2016 academic session is out. 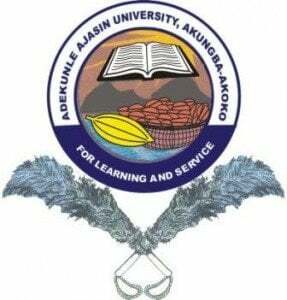 Adekunle Ajasin University, Akungba-Akoko (AAUA) Faculty of Agriculture Change of Course Form for the 2015/2016 academic session UTME candidates has commenced. Applications are invited from suitably qualified candidates into a five year Degree programme of the Faculty Agriculture in the following courses. Prospective candidates must have sat for the AAUA PUTME held in August 2015 and must have scored a minimum of 40% to qualify for admission. i.Agricultural Economics: Five ‘O’ Level Credit passes in English Language, Mathematics, Chemistry, Biology/Agricultural Science, Economics with at least a pass in Physics. ii. Agricultural Extension and Rural Development: Five ‘O’ Level Credit passes in English Language, Mathematics, Chemistry, Biology/Agricultural Science, Economics with at least a pass in Physics. iii. Animal Science: Five ‘O’ Level Credit passes in English Language, Mathematics, Chemistry, Biology/Agricultural Science, and Physics. The Credit pass in Agricultural Science must be in addition to at least a pass in Biology. iv.Agronomy: Five ‘O’ Level Credit passes in English Language, Mathematics, Chemistry, Biology/Agricultural Science, and Physics. The Credit pass in Agricultural Science must be in addition to at least a pass in Biology. v. Fisheries: Five ‘O’ Level Credit passes in English Language, Mathematics, Chemistry, Biology/Agricultural Science, and Physics. The Credit pass in Agricultural Science must be in addition to at least a pass in Biology. vi. Forestry and Wildlife Management: Five O’ Level Credit passes in English Language, Mathematics, Chemistry, Biology/Agricultural Science, and Physics. The Credit pass in Agricultural Science must be in addition to at least a pass in Biology. Note: Candidates are advised to complete the application for change of course online and those that had been offered provisional admission but are still interested in any of the outlined departments, can still apply for a change of course into the Faculty. When will they release their 2nd batch please? @Abdulsalam Omowumi, the 2nd batch admission list update is available here. Can I still apply for the change of form? @sola, the portal is still live. @adebisi olawale, you can give it a try.